Today is a special day. First of all, it is Father’s Day, a day we set aside to honor the role fathers have played in our lives. In this environment here in America in 2008, the role of fathers seems to be continually beset with ideas of irrelevancy. As I see it, that is a symptom of a God-minimizing approach to families. However, we are not discussing that today. 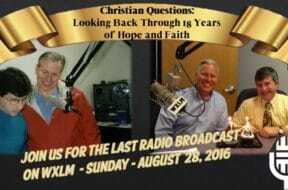 No, today we are celebrating the amazing opportunity that Jonathan, myself and our crew have had in bringing Christian Questions to you on a weekly basis, for today marks this program’s 10th year anniversary! So, stay with us and look back at how we got started, where we have been, what has happened and most of all, how we have been blessed by God! How can we show our thanks? Well, let’s try! Are You Willing, or Are You a Rebel?